What is the best way to feed your fish? Well, just like us humans, fish also grow their best when they eat plenty of natural, well balanced food. Depending on what type of fish you have, feeding them all natural food is the best for you and for the environment where they grow in. Are you a fish farmer? Or maybe you are raising fish in a tank in your home and you want to provide the best nutrition so they are healthy and vibrant. No matter what type of fish you have your fish would grow a lot healthier if fed an all natural food. Just like us, they need a nutritionally balanced and environmentally friendly diet to grow healthy. Natural food also retains the ecological balance of the environment that they live in. Your fish would also grow much healthier if you supply them with a variety of different kinds of food. You have many different options to choose from. However, there are several things to consider before you buy food for your fish. Understanding the feeding requirement for your fish is one of the main determining factor of your fish feed. What they will eat will depend on the type of fish you have and their feeding habits. You also need to take the environmental factors and cost of feeding into consideration. To maximize your profits from fish farming it is best to consider keeping an ecological balance in your pond or fish tank with different types of fish and plants. Several options for maximizing your fish farming profits are given below. To choose the right type of feed, it is important that you know what type of fish you are raising in your pond. 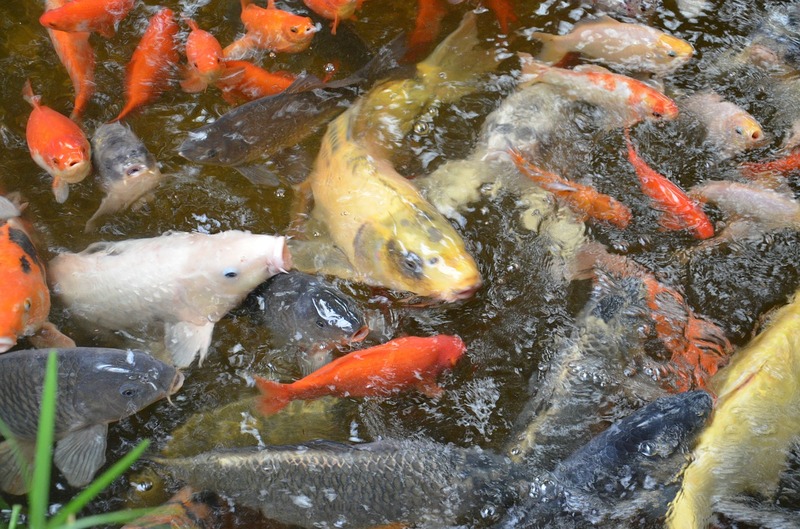 Mixing your pond with different types of fish will increase biodiversity and natural ecological balance of food. Your fish can be categorized in two ways, based on diet and based on feeding habits. Your fish could be categorized in three ways based on their diet. Herbivorous fish: Herbivorous fish are vegetarians. They will eat a plant based diet only, like algae, vegetation, and fruits. They do not need a fish protein based diet. They often have small stomachs so they must eat frequently. You need to feed them several times a day if you have a fish tank full of herbivores. 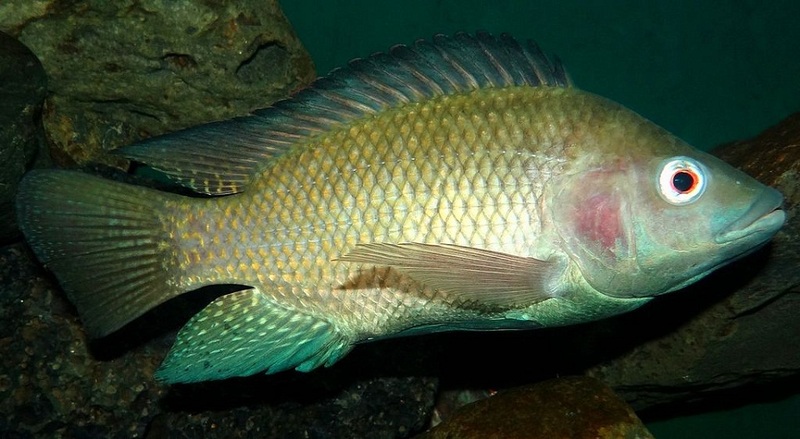 Tilapia, mollies, goldfish, several types of shellfish and mollusks will feed on plants and algae. Carnivorous fish: Carnivorous are meat eating fish. They are predatory or scavenging fish. They prefer mostly live food, such as worms, shrimp, other smaller fish, or insects. Walleye, perch, muskie (muskellunge), salmon , and, pike, are some of the examples of carnivorous fish. Omnivorous: Omnivorous fish will eat almost anything. Their diet has a lot of flexibility making them the easiest type of fish to feed and raise in your pond or tank. Catfish, Koi, sand shiners are examples of omnivorous fish. The natural habitat of your fish play an important role when forming dietary habits. What it eats is often determined by where it lives. Salt water fish and fresh water fish for example, can have very different diets. Some behavioral factors for choosing the right type of fish feed for your fish pond is described below. Top feeders: Top feeders or surface feeders dwell on the top-level of your pond or aquarium. These can add color and movement to the top level of your aquarium or pond. They like to float to the surface for sunlight, food, and oxygen. Some of the surface feeders are also strong jumpers when it comes to catching food such as insects or floating food. Silver Hatchet fish, glass catfish, and butterfly fish are some of the common top level feeders. Any type of floating feed is good for them. Use floating type of pellet food for them. Mid feeders: Between the top feeders and bottom feeders, the middle feeders dwell. Feeding these fish needs some extra care because all your food can sink quickly to the bottom or stay floating on top and the mid-level feeders can be left out. It is best to use feed that sinks slowly for mid-level feeders. Angelfish, The Tiger Barb, Pearl Gourami, and Guppy are some of the mid-level feeders. Bottom feeders: Bottom feeders can act as a cleaning crew for your pond or aquarium. If you have bottom feeders in your fish tank or pond, they will eat anything that sinks to the bottom. Catfish, shrimp, tilapia, carps, and snails are algae eating fish and are excellent bottom feeders. If you use commercial pelleted feed or tablet feed, use the sinking type for them. Cost of your feed can vary depending on the type of food and the quantity of food you are getting. Some food encourages fast growth and has a great feed to fish conversion rate. Some fish need to be fed frequently, while others can subsist on feed naturally foraged from their surroundings and don’t need too much additional food. To keep your feeding cost to minimum, try feeding fish with natural elements such as waste from your other agricultural systems. Waste from your garden, poultry farm, worms, and insects can also become food for your fish. Keeping several types of fish, algae, and plants in your fish tank or pond can create an ecological balance. 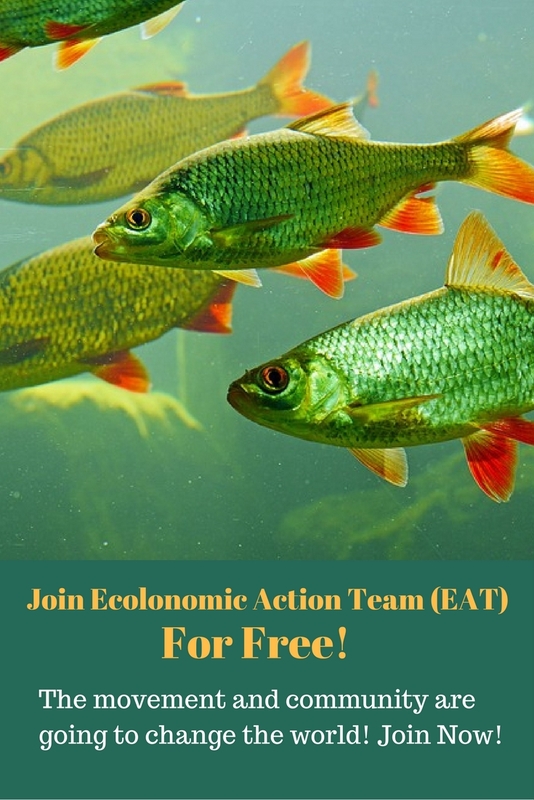 This ecological balance would create food for your fish naturally and reduce the need to feed your fish with commercial fish feed. You can use several types of commercial fish feed as supplements for faster growth or for maintaining aquarium fish. Floating and sinking pellet and flake fish feed: Pelleted fish feed is available for feeding a large variety of fish. They are usually formulated for different types of fish, with all the nutrients your fish will need for proper growth. These commercial fish feeds have to be stored in airtight containers because they often lose their effectiveness once they are opened and exposed to air for a long time. They also lack in fiber which may need to be supplemented in another form. Freeze-dried fish feed: Freeze dried food can be a safe and nutritious source of food for your fish. They are formulated to give your fish all the balanced nutrients and fiber they need. It can be used both as a staple fish feed or supplement. Frozen food: Frozen food is a little less expensive than live fish feed available in the market. However, they can be equally safe and nutritious for your fish. 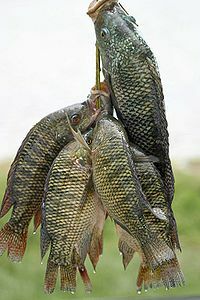 Frozen fish feed is excellent for feeding predatory or carnivorous fish and it is also less likely to carry pathogens. It is important that your fish feed is nutritious, well balanced, and made with natural ingredients. Feeds that contain chemicals, such as preservatives, may become toxic and cause pollution to your pond or aquarium. Run off water from your fish ponds could also pollute nearby water sources if chemical preservatives, herbicides, or other potentially toxic chemicals are used for farming. Synthetic food and fish derived from other fish can also cause ecological imbalance. Serving feeder fish as food is also controversial. You should feed your fish just enough to be cost effective. Overfeeding your fish is harmful for your fish tank or pond. Food that is uneaten by your fish can cause damage to the water quality and fish health, and also invite pathogens and predators. Creating a fish community with several types of fish would enhance the ecological balance and biodiversity of your pond, which would also reduce the need for additional food supplement for your fish. Some fish like the surface feeders can be raised for ornamental reasons, while the bottom feeder fish that live on algae at the bottom of your tank or pond provide cleanings services for your pond or fish tank naturally. We will be giving you more tips on fish feed and fish farming regularly, so please read our blogs. For more information, click here to book a meeting with us. You may also call our office at (303) 495-3705 to get a hold of us. Was this post useful? We would appreciate your comments and feedback on it. So, please don’t hesitate to add your comment in the comment box below, or on our Facebook page. EGGS, LIVESTOCK PRODUCE/POULTRY FEEDS AVAILABLE AT A LOWER RATE. Call: 07035907330 Or Whatsapp: 08103953855. To make alot of profit in poultry business, you have to cut the cost of feeding your chickens in half and maximize your profit, I’m a local manufacturer and distributor of top quality Poultry Feed in Nigeria. I sell at an affordable rate of N2,000 per 25kg bag, I have starter, Grower, Finisher and Layer Mash available. I distribute to all parts of the country to Sub-distributors, Wholesalers, Retailers and End-users. Stop buying the very expensive so called foreign feeds that are reaping you of your profit. Types of Cages available: Normal cage & Electric fully automatic cage and more. Days of Delivery is: Monday to Saturday. Its very intersteing and informative news. thanks for sharing this .